If you were to look up the phrase "necessary evil" in the proverbial dictionary, air travel would be right up there with the worst of them. Crying babies, long lines, nasty food, overly chatty travelers...sometimes it's hard to remember why you didn't just road trip instead. My least favorite part may be the ever-so-slight stickiness that makes touching pretty much anything on an airplane an extraordinarily unsavory experience. And, it turns out, those surfaces don't just feel gross; a new study suggests they're also the ideal environment for some pretty gnarly bacteria. Researchers at Auburn University took samples of six airplane surfaces: window shade, leather upholstery, armrest, toilet-flush button, tray table, and seat pocket. They then introduced two dangerous bacteria that are known to be contractable via skin contact — methicillin-resistant Staphylococcus aureus (more commonly known as MRSA) and E. coli O157:H7 — and documented how long the bacteria were able to survive on each surface sample. 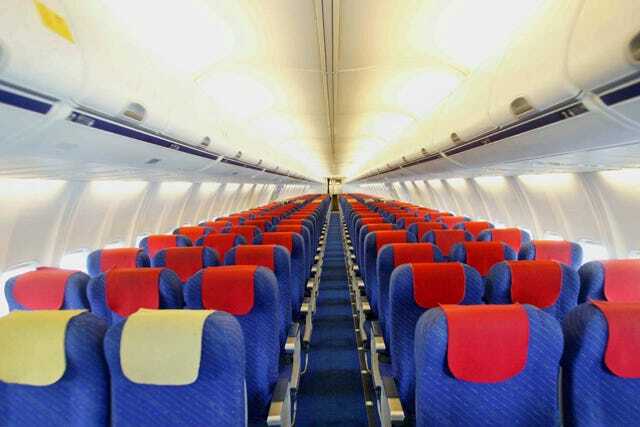 The data showed that both bacteria could live on each airplane item for several days. The "winners"? MRSA was able to survive for 168 hours (or seven days) on the cloth of a seat-back pocket, while E. coli lasted for 96 hours (or four full days) on the plastic from an armrest. The team said the next step is to research better cleaning methods, as well as the effectiveness of using materials with inherent antimicrobial properties. In the meantime, of course, keep washing your hands, minimize touching shared surfaces, and try not to think too much about the cesspools of rapidly multiplying, potentially deadly bacteria that surround you during the grotesque misadventure that is flying the so-called friendly skies.